Living aboard is a big, exciting adventure. Not to mention a dream come true. But, before we decided to move forward with buying a boat, we had to be sure that this lifestyle would work for us financially. Reducing our monthly living expenses was certainly an appealing aspect of going tiny. But, because we took out a loan to purchase our boat, we won’t reap major financial benefits for a few years. In the meantime, here’s the breakdown of how our finances are shaking out. The boat that would eventually become The Catalina Wine Mixer was originally listed for $220,000. After doing some research (well, after Brian did all the research) we decided to offer $190,000 based on the available comps. We were also willing to pay a bit higher than average, given that this boat came with a liveaboard slip, which is incredibly difficult to find. After some negotiations, we settled on a final sale price of $199,000. Getting a loan for a boat purchase isn’t exactly easy. Most brokers prefer that you have about three times’ the boat’s value in liquid assets. Umm, if we had that why would we need a loan? Thankfully, our yacht broker was able to find us a reputable loan agent with reasonable rates. We ended up taking out a loan for $162,800 (we put just under 20% down) over 12 years at 5.24% interest. So, our monthly “mortgage” payment is $1,525. We can’t wait to get this thing paid off! We’re also on the hook for a hefty 9% sales tax. So, come April 2018, Uncle Sam will get a big check from us. Ouch. At least this was a one-time purchase tax. We’ll also have to pay a small property tax to Marin county, where we keep our boat. That’ll likely shake out to about $2,300 a year. If we weren’t living aboard, we’d be paying a cool $8 per foot. But, since we’re a high-use tenant, we’re also responsible for an additional $400 per month. This covers our rent for the slip (basically our boat’s parking spot), dock maintenance, use of the facilities (there are bathrooms and showers on site), water usage and garbage service. Our harbor master has also agreed to let us get packages delivered to her office and park our cars here full time. So, that puts our monthly dock fees at $775. Water and garbage are included in our monthly dock fees (sweet!) so we’re just responsible for our electricity bill. And our monthly energy costs have gone down significantly since downsizing. Managing our power usage is a little more work on the boat – especially because we can only use about 30 amps at a time. That means if we’re using the stovetop and the water heater, we can’t use the coffee maker. If I want to blow dry my hair, I always check to see what’s currently in use first, so we don’t blow a fuse. This sounds like a way bigger inconvenience than it actually is. It just takes a few seconds to flip a power switch on or off, and we like being more conscious about our consumption. So far, our monthly energy bills range between about $100 - $150, depending on how much we’re using the heater. That’s about half of what our monthly PG&E bill had been on land. And we, of course, have internet ($40 month) and a subscription to Netflix ($12 per month each). That shakes out to about $42 every month (and is totally worth it). This brings our average annual planned maintenance costs to about $5,500 per year. I’d always heard that stuff breaks on boats all the time, but I figured boat owners were just being dramatic. I was wrong. Since we’ve moved aboard, we’ve addressed a loose belt, a leaking lip seal, and a broken sanitation system! It’s impossible to anticipate what will break and when, so out of an abundance of caution, we plan to set aside $2,400 for unexpected maintenance each year. Our monthly costs are a bit higher than we’d hoped, but they’re still about $400 less than what we were spending in our old condo ($3,100 per month in rent, $350 for utilities, $150 for cable, internet, etc.). And it feels good to be investing our money in something that we own. Even better, once we get our loan paid off, we’ll be sitting pretty at about $1,800 per month! 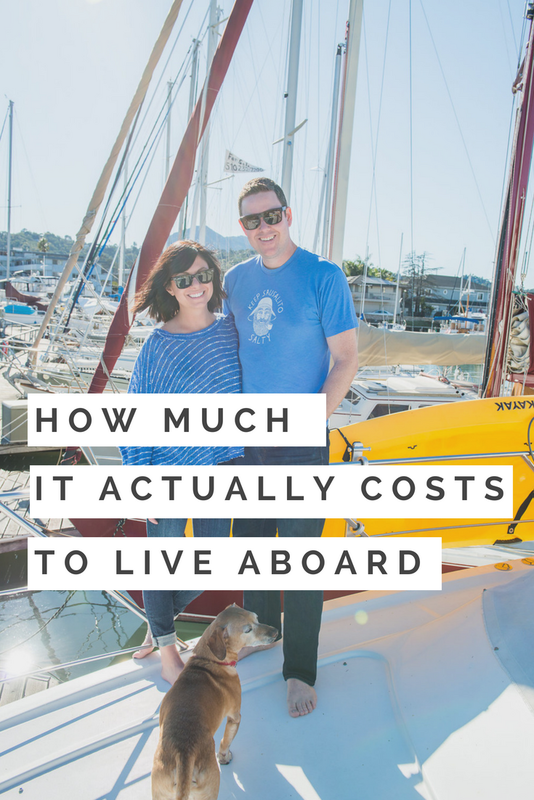 (Less when we're traveling and not using our liveaboard slip and utilities). Compare that to the median home price in Marin County (an almost record-breaking $1,127,500 last year) and we have the best in town! The one factor you can’t put a price on is how much fun we’re having. We’re living out a dream, and that’s completely priceless.